In the effort to provide a historical context for the current crisis, I thought it would be useful to look at some of the broad economic trends in Greece over the past few decades. My goal is not to highlight something that I have written about before – that the 1980s were an economic black hole – but rather to remind Greeks that it wasn’t too long ago that we had a vibrant economy capable of producing meaningful and sustained economic growth. Economic growth. In the 1960s and 1970s, growth averaged 8.5% and 5.5%, respectively. Even accounting for population growth, the average Greek person had a real income that was three times larger in 1979 than it was in 1960. Then economic growth stagnated, and real incomes per person were flat in the 1980s. Growth resumed in the 1990s, but at merely 1.1% per capita, it was anemic. It wasn’t until the 2000s that growth returned to high levels – albeit, driven in part by excessive government spending. Real compensation per employee tells an even more dramatic picture: labor saw no real increase in compensation from 1980 to 2000. Industrial output and productivity. Industrial production growth went from near double-digit increases in the 1960s to a minor slowdown in the 1970s (to 8%) and then started an irreversible decline. Unlike per capita growth, however, there was no real recovery during the 2000s: in fact, industrial production peaked in 2000, underscoring the economy’s overdependence on services. Total factor productivity also went from rapid growth in the 1960s (6%) to high growth in the 1970s (2.5%) to decline in the 1980s and a modest recovery in the 1990s. Effectively by 2000, the economy’s productivity was on par with 1979. Only in the 2000s did Greece started to experience some productivity gains. Inflation. Inflation was modest in the 1960s but it exploded after the first oil shock (1973-74) and after a modest fall in 1975-1978, it entered a sustained period of high levels. It was not until 1995 that Greece was able to reach single-digit inflation rates. After entering the Eurozone, inflation was at 3.16%, which was still high relative to its peers, slowly eroding the country’s relative competitiveness. Unemployment. Unemployment followed a slightly different trajectory. Throughout the 1960s, unemployment averaged around 5%, and it then began a significant decline, reaching 2% in 1973. Low unemployment persisted until 1979, after which time it started to rise. The decade-averages, however, conceal some sub-trends. Unemployment rose between 1979 and 1983, but it then steadied; it was only after 1990 that it started to rise until peaking in 1999. After that, there was a 50% reduction (from 12% to 8%) to 2008. Standard of living. 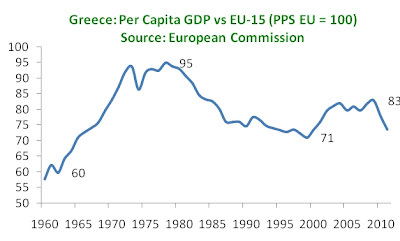 This graphs tells the story of Greece better than any other: it shows Greece’s per capita income on a purchasing power parity basis relative to the EU-15. 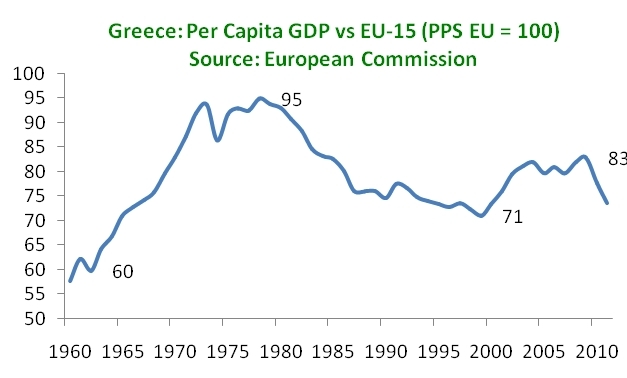 In 1978, as Greece was negotiating its entry into the European Economic Community, its per capita GDP was just 5% below the European average. Then came a twenty year slide – by 2000, the income gap was 30%. All that Greece accomplished by faster growth in the 1990s was to slow the widening gap. 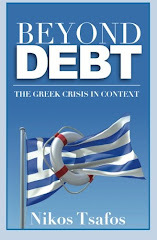 It was not until the 2000s that Greece started to converge, but even that trend was short-lived – by 2004, all the gains has been achieved. These numbers show that the 1980s and early 1990s produced not just the debt overhang that still plagues Greek finances, but they also strangled what was, until then, a vibrant economy. They did that by introducing an excessive statism, both directly through state spending and indirectly through interference in private industry. Industrial production and productivity both stagnated, leading to a progressive deterioration in living standards. In that sense, the dismantling of statism could potentially energize a dormant private sector in Greece – it was not too long ago that Greece had a strong economy and there is no reason that a new structure cannot produce one again. Finally!finally an article that is clear, comprehensive and above all objective as opposed to conspiracy theory/panicked articles that abound! Thank you! Any idea what the GDP in Greece was at the time of the Colonel's Revolt? Just read the sentence 'No democracy has ever been subverted...in a country with a per capita income higher than that of Argentina in 1975: $6 055' (Przeworski et al. 2000).